First burial, Elizabeth Jacquez 54, on July 1, 1844. I was concerned about going to this cemetery. I grew up across the river from this city and was worried about going to this area, as a woman of small stature, carrying camera gear, by myself. I ended up going on a spur of the moment trip there with my husband in tow. Once inside the gates, I forgot where I was. What a simply beautiful place! The grounds are well kept, the trees well trimmed and the entrance generally welcoming in the midst of this busy urban setting. When coming through the great sandstone entrance you are struck by what must have been the grandeur of the place in the 19th century. I chose to bear right when entering, not for any reason in particular except that it seemed to draw me that way towards the visible old receiving vault. This brownstone edifice was about the size of an average garage. Old, ornate rusted iron gates stood locked at the entrance, with two arched windows on either side, and two rounded Canterbury Crosses above. This majestic looking building, with flagstone walk, is little more than a gardener's shed now. But once upon a time, this held those who were about to return to the dust. The far right, towards the back, runs "Millionaires Row". An avenue of mausoleums in a tree-lined path. Each being more or less the same size but with variations of styles for columns, plinths, roof lines, doors, windows, etc. It was among these aging houses of the dead that I received the first true shock of all my cemetery hunting days; a tomb was broken open. Peering inside one of the great miniature houses I discovered the marble face slab had been smashed in to reveal the edge of the coffin resting inside. From the entrance end, I could plainly see the coffin, looking to be a walnut brown with brass handles. The far end (head or toe I know not) I very luckily could not see - for it was there that the heavy marble slab had crashed down onto the box inside, and sat firmly implanted. There was no question in my mind that the inhabitant of the house had been sorely disturbed. As I moved to other buildings, stepping up renvently up each single slab step to peer inward, I jumped back from one. Shocked to my core - although in retrospect now I admit my initial reaction might have been dramatic - a coffin pulled from its niche, lying askew, half in and half out of the final resting place. Glass of the doors broken, and the edge of the box pressed up to the doors. If I had had a mind to, I could easily have touched the box, rusted with age and reminding me all too clearly of the nature of the place I walked so easily in. It was a shock I think, to see the disrespect. This was vandalism at its very worst. The exposed coffin was tagged by the manufacturer and I was able to trace the age of said box. It was an ironclad from Boyertown Caskets. I silent apologized for the unrest, for the desecration and whispered a soft prayer for eternal rest. While the ground gave no reminder to the location, this clearly spoke of a once upon a time rural location turning inner-city urban with all the grit and grime of mankind that seems to travel with so-called progress. As I continued my journey through the lovely wooded areas found in Mount Pleasant, I found stunning monuments to entire families. Those of wealth and privilege in a time gone by, such as the Merz-Roth family. The first branch of that family, before marrying into the Roth side, had a much more impressive plot; a domed top monument surrounded by stones for each family member of all side. The grandeur of this monument could not be ignored, this was a family who wanted to be remembered. The patriarch of the family founded a prosperous fabric dying empire in the early 19th century in this same city. His wealth must have been considerable to have such a piece of art installed to be remembered by! Ivy climbed stones, autumn leaves creating a soft path filled with the diffused light of oranges and yellow for me. Moving further back, away from the sounds of the main drag of the city by which you enter, you become lost in this city of the dead. I adored the shadows and the hills and valleys. The old iron "street" signs to direct you to the path of your loved one was a touching piece of the history of these grounds - before "plot/lot/section" numbers too over. Towards the back of the grounds, you come upon a famous grave, that of Thomas Edison's first wife. The concrete flower box in front of the large, urn topped stone is in crumbles, mixing with the fall leaves. Edison himself was buried here for a short time, then taken up to be re-interred at his beloved home in West Orange. The drop off towards what was once nothing but a dirt path along the river is now the busy Route 21 highway. A number of crypts are built into the hillside here, each one with a solid concrete door covered by an iron gate. Almost taken over by ivy now. I imagine this location, a century ago was a pleasant one overlooking the river, now it seems the most forgotten part of the cemetery. A number of smaller stone, more recent to the 20th century, are found here - seemingly scattered with a random toss. Litter blows up to the edge here, blown off the highway with the whizzing cars as the catalyst for the whirlwind effect. Mount Pleasant is still just that, pleasant. A few distractions to that pleasantness found, but overall a peaceful resting place, a place of quiet solitude in a place now known for so much noise and motion. This stone struck me as the reverse has no text. 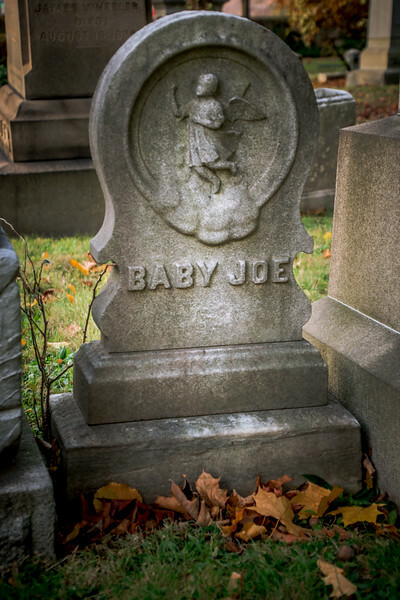 Simply Baby Joe.